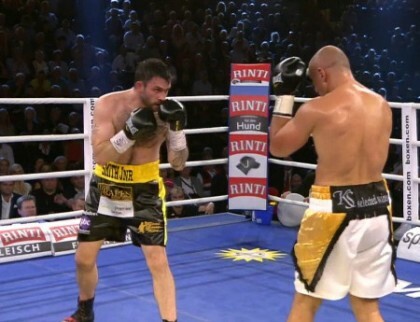 By Scott Gilfoid: #5 WBO Paul Smith’s appeal to the World Boxing Organization to have them order an immediate rematch against WBO super middleweight champion Arthur Abraham (41-4, 28 KOs) have been turned down by the WBO. Smith lost a 12 round unanimous decision last month to Abraham by the scores of 117-111, 119-109, and 117-111 on September 27th. Smith and his promoter Eddie Hearn felt those scores were too wide, especially the 119-109. Indeed, Smith thought he’d been robbed of a decision despite the fact that Abraham was the busier fighter of the two, and the one that was landing the cleaner shots all throughout the fight. Well, there it is. Smith has been turned down in his attempt to get an immediate rematch. However, he will still likely keep his #5 ranking with the WBO, which will at least keep him in the position to get another world title shot in the near future against Abraham or whoever. Abraham is keen on fighting the winner of next month’s clash between Robert Stieglitz and Felix Sturm. He especially wants to fight Sturm, because he’s never fought him before, and he sees a fight between them as a big fight in Germany. I don’t know that Smith proved that he belongs up there. He clearly lose the fight against arguably the weakest of the super middleweight champions by a long shot. I mean, Abraham is not considered to be in the same league as the likes of Anthony Dirrell, Andre Ward or Carl Froch. Smith lost the fight to Abraham, and that’s kind of an indication of where he’s at in terms of talent. I had Smith losing by a wide score because Abraham did just enough to win almost every round. Even in the rounds where Smith did reasonably well, Abraham was landing the cleaner shots and pretty much outworking him. Smith’s promoter Eddie Hearn will likely get him a rematch with Abraham, and I wouldn’t be surprised if that fight takes place in the next 2-3 months. However, I don’t see it being any different than the first fight. Smith doesn’t have the firepower to hang with Abraham, and it doesn’t matter how many rematches his promoter Hearn gets with Abraham, I see him losing each time. It’s actually a good deal for Abraham to be getting rematches with Smith, because it gives him a chance to milk his title for a little while longer. Abraham is about to turn 35 in February, and he’s not looked good since in least 4 years since he left the middleweight division. If Abraham can keep getting rematches against Smith, then that will give him the opportunity to extend his reign as the WBO super middleweight champion a lot longer than if he would be if he were forced to fight some of the top contenders in the division like Gilberto Ramirez and Andre Dirrell. It’s going to be interesting to see if Smith appeals once again if he loses for a second time to Abraham by a decision. I can see a scenario where Smith potentially loses a second time and then he appeals to try and force another immediate rematch. At some point the WBO will need to push Abraham to move on and start defending his title against his mandatory challengers rather than getting stuck on a never-ending cycle of Smith rematches.